Dhaka, Mar 7 (Just News): One day into his arrest, pro-BNP Swechchhasebak Dal president Shafiul Bari Babu was put on a seven-day remand on Wednesday, in a case filed for alleged attempts to create obstacle to law enforcers’ duty. Dhaka Metropolitan Magistrate Sabbir Yasin Mahmud Chowdhury passed the order after the police appealed for a 10-day remand in the case filed with Shahbagh police station in the capital. Eleven other leaders of pro-BNP Jatiyatabadi Chattra Dal and Jatiyatabadi Juba Dal were also put on three days remand each in the same case. Jatiyatabadi Swechchhasebak Dal, Jatiyatabadi Chattra Dal and Jatiyatabadi Juba Dal are the three key affiliated organisations of country’s main opposition Bangladesh Nationalist Party (BNP). 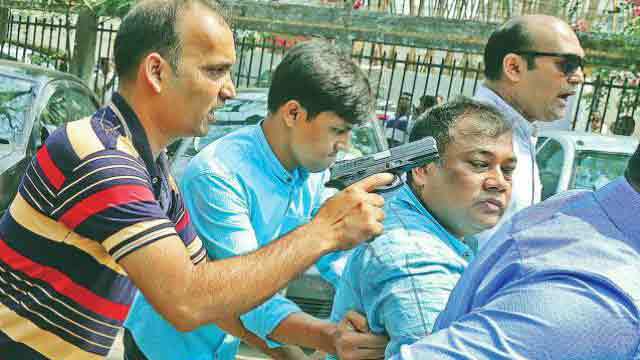 Earlier on Tuesday arms-wielding plainclothes police detained Swechchhasebak Dal president when BNP formed a human chain in front of the National Press Club in the capital.